Matrox on Sunday unveiled its new DS1 Thunderbolt docking station, which allows users to add multiple peripherals like an HDMI display, a full-size keyboard and a mouse to a Thunderbolt-equipped Mac or PC for $249. The DS1 also includes a gigabit Ethernet port that provides connectivity to wired corporate networks at data transfers 18 times faster than Wi-Fi. In addition, it has a high-speed USB 3.0 port, two USB 2.0 ports, a microphone input, and a speaker/headphone output, all of which can connect to a Thunderbolt MacBook or Ultrabook with just one cable. 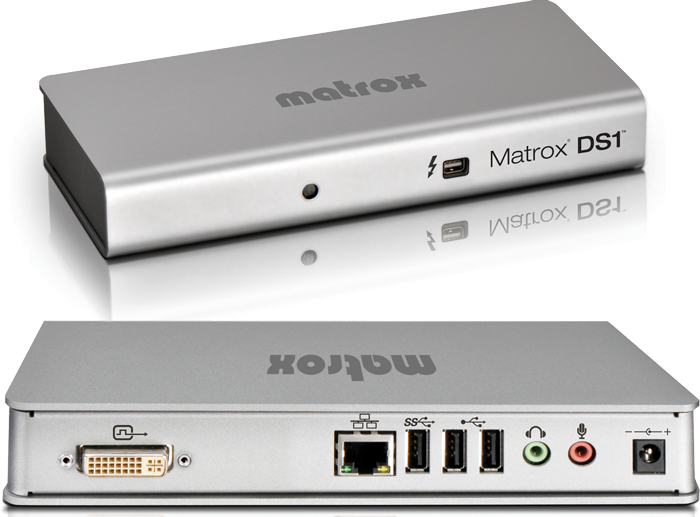 The Matrox DS1 has a solid aluminum construction that the company said is ideal for office, home or dorm use. It will be available at authorized dealers in September for $249 U.S.
"Todays MacBooks and Ultrabooks are powerful enough for most corporate users but their limited connectivity makes them inconvenient, and their small screens and keyboards make them uncomfortable to use in the office all day," said Alberto Cieri, senior director of sales and marketing at Matrox. "The new Matrox DS1 docking station easily enables the creation of an ergonomic workspace and brings much-needed expandability for printers, scanners, storage, smartphones, optical drives, cameras, flash drives, and other peripherals." The Matrox DS1 will be showcased at the Computex Taipei 2012 event at Intel's official booth, located at M0410 in the NanGang Exhibition Hall. "Thunderbolt delivers unparalleled performance, flexibility, and simplicity to personal computing," said Jason Ziller, Intels director of Thunderbolt Marketing. "Products like the Matrox DS1 docking station help highlight what Thunderbolt makes possible." Also set to arrive in September is Belkin's Thunderbolt Express Dock, which was announced earlier this year at the Consumer Electronics Show. It will also turn a Thunderbolt-equipped Mac into a full-fledged desktop workstation with an HDMI port, FireWire 800 port, three USB 2.0 ports, a 3.5-millimeter audio port, one gigabit Ethernet port, and two Thunderbolt ports for daisy-chaining to another Thunderbolt device. Apple also offers the Thunderbolt Display, which lets users plug in one 10Gbps Thunderbolt cable to drive a monitor, three USB 2.0 ports, one FireWire 800 port, one Gigabit Ethernet port, and a Thunderbolt port for daisy chaining up to five additional Thunderbolt devices.